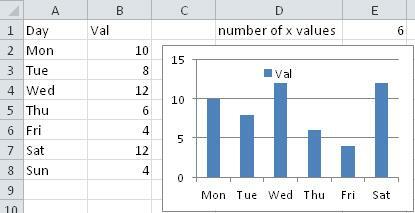 Does anybody know what the problem is / how to create a dynamic chart range from a specific start to specific end point? Here's a nice Chandoo post on how to use dynamic ranges in charts. The way you are trying to do it is not possible. Chart data range has to have a fixed address. Just another answer for bits and googles.. If you still want to refer to your start and end cells, you'll need to add a separate formula for your Day Range and your Values Range. Formulas are below and the screenshot shows the formulas used. 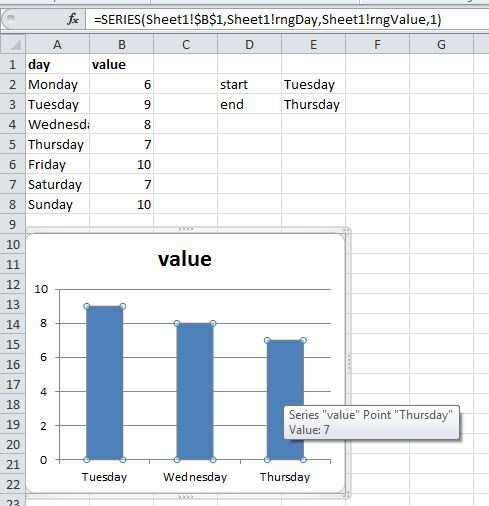 I use OFFSET to create a defined name formula so that I may define all the ranges for the data, allowing me to have a starting a ending date (or the beginning and ending position of any data set). You will have to define as many names as Series you want to include, following the same procedure. In this simple case, I only included Car sales. Initial Month and Last Month are Range Names defined for single cells used to indicate which months of the graph will be included (from starting to ending months). Remember, as explained by Sean Cheshire and others, that to use the names for the chart values, the name of the spreadsheet must be included. According to the formula you have shown: =INDIRECT("sheet! "&E2&":"&E3) you are not naming the sheet correctly. I would have thought it would be Sheet1! or Sheet2! etc. Your formula resolves to =sheet!E2:E3 which is not a valid address. The error message you are getting means Excel cannot resolve the input to INDIRECT. INDIRECT is a valid function so the argument you offer it must be invalid. 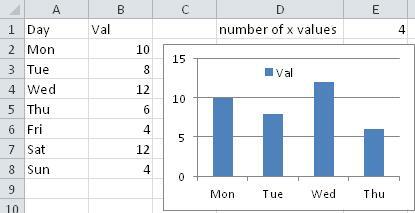 Named formula with Indirect functions DOES NOT WORK IN CHARTS. It works in other froms as your desired dynamic source will be highlighted, but when you it in chart, it would not be evaluated. Hope Microsoft put a fix on this. When a line chart's range is a named variable, and the variable has INDIRECT() references through a cell to a range, then the variable must have at least 2 INDIRECT()s separated by a comma. singduck is a new contributor to this site. Take care in asking for clarification, commenting, and answering. Check out our Code of Conduct. Not the answer you're looking for? Browse other questions tagged excel dynamic range excel-formula excel-indirect or ask your own question. Using Indirect within an Index function?